When I was 13 or 14 there was this hit music in Portugal with a verse on reading the ‘Lord of the Rings’. The melody was pretty cool, but I had no idea what the lyrics were going on about. A the time there was no Internet to look it up (I’m getting vintage, I know), so it took me a while to go to the library and ask if they had ‘those books’ and if it they were any good. Needless to say that I feverishly devoured them! For those of you that read the books, I guess you know what I’m talking about. The plot and the magnificent descriptions play with your mind in a way that makes you believe that Hobbits and Elves exist and are fighting to save our world. You end up dreaming with walking and talking trees and dreading orcs. I was hooked! At the end of the 90’s, Peter Jackson (Sir Peter Jackson these days) took on the challenge to make a movie out of Tolkien’s masterpiece. With a mega-budget of nearly 300$ million, he decided to film the three ‘Lord of the Rings’ movies in his native country New Zealand. Sign post for the Green Dragon: beer time! You can have a bite if you want! All the produce in this Hobbit vegetables’ garden is real. Look at these greens! You almost start feeling a Hobbit yourself! New Zealand is the antipode of our home country Portugal! Being in New Zealand and being both fans of Tolkien, it was pretty obvious that we had to go to some of the places used to film the movies. The first one was Mount Ngauruhoe (Mount Doom in the movies). It’s a perfect coned volcano distinguishable from very far away. 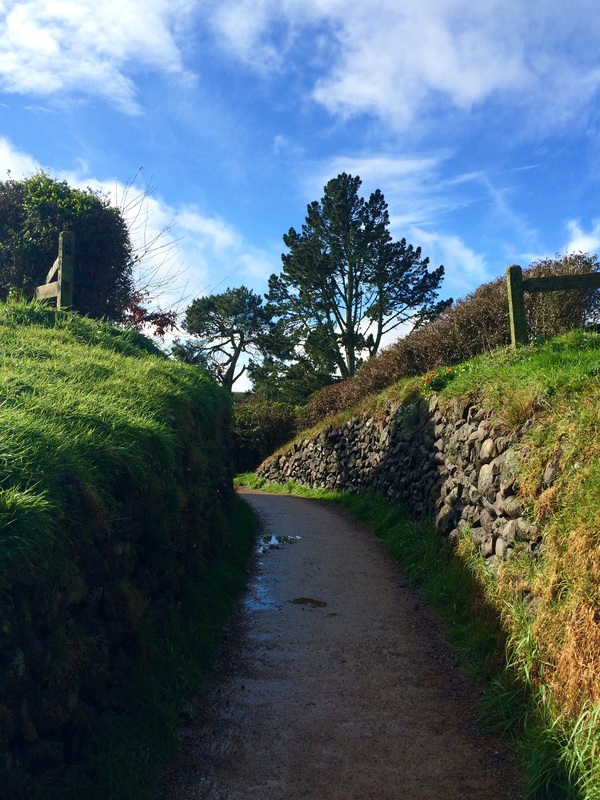 It both attracts and defies you, so it’s easy to understand why Peter Jackson chose it for such an emblematic place. For us however, Mount Ngauruhoe will be the first big regret we have from this trip. An active volcano, with Mordor style landscapes and the promise of an amazing view from the top, how could we not want to hike it? Well… it’s winter, so the mount, packed with snow and ice, is impossible to hike without serious winter gear. We ended up only seeing it from the distance, but we are definitely coming back to do it! The next movie set was much more accessible: the place where they filmed the Shire scenes. It has the appropriate name of Hobbiton, and it is located in the beautiful Alexander Farm, a three hour drive from Auckland. As history goes that, back in 1999 Peter Jackson was resigned to shooting different Shire places (Bag End, Green Dragon, etc) in different farms, when his crew spotted Alexander Farm from an helicopter. It ended up being the perfect place to set up the whole village – Hobbiton is born! It was not an easy task though. Peter Jackson was relentless in his quest for perfection. For instance, the tree on top of Bilbo’s house is fake, made out of steel and silicon. Ten days before starting to shoot the movies (the initial three were shot at the same time), he decided that the green of the leaves was very ‘unnatural’ and ordered each leaf to be hand painted individually to a more ‘leafy green’. We are talking about millions of leaves (that nowadays are replaced every year, as tourists insist on taking them as souvenirs)! All the remaining vegetation is real, including the vegetables growing in the gardens, which gives the place an odd touch of reality. You almost expect to see Frodo coming out of a Hobbit hole (by the way… there are forty four Hobbit holes but no Hobbits in Hobbiton, which was a bit of a turndown). Although the films included a lot of post production special effects, there were some clever tricks done with the scenery. For instance, the Hobbit holes have different door sizes. This way, if you put Gandalf near a small door and Frodo next to a big door, you emphasize the height difference between them (a Hobbit is supposedly only about a meter tall). 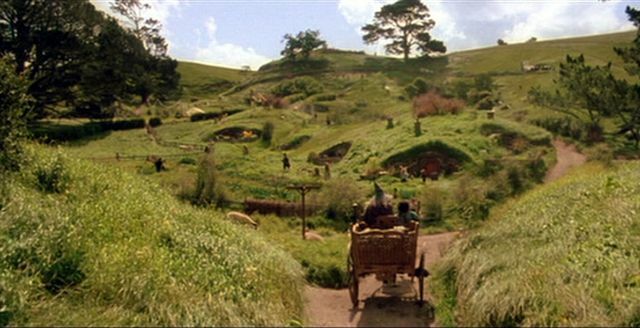 Another clever trick was done in the scene where Gandalf and Frodo enter the Shire together in a carriage. In the movie we see what looks like a perfectly normal carriage. However, in reality, the passage is very narrow and the carriage is very long. Gandalf was sitting in the front row, and Frodo farther away in the back row. By positioning the camera in the right angle, you get the perspective that Gandalf is much taller than Frodo, with no post editing needed. Even if you don’t like ‘Lord of the Rings’ (is that even possible? ), the landscape at Hobbiton is so beautiful – with luxuriant greens and wooly sheep spread along the hills – that I’m sure you would enjoy the visit and pretend for a bit that little Hobbits with furry feet do indeed exist. Our next destination will be the much warmer Australia, with the cool surfing beaches and the Great Barrier Reef. Talk to you from there! Ficamos então à espera do novo post da Austrália! Deste gostei das casinhas e do verde, absolutamente lindo! Lindo, lindo, lindo! Abriu-me o apetite para ver os filmes (não os vi) e para reler o primeiro dos livros e ler os outros dois. Este tipo de literatura também me fascina, mas deixei de o ler por não conseguir parar, e às vezes isso era um problema! Quem sabe, se esses mundos não são tão reais como os que conhecemos, apenas pensamos que não? Como diz o outro, “não acredito em bruxas, mas que as há, há!”.